BOCA RATON, Fla., Nov. 12, 2018 -- 4ocean, an ocean cleanup company headquartered in Boca Raton, Florida, will unveil their new Ocean Plastic Recovery Vessel, a 135-foot vessel outfitted with 48,000 gallon fuel tanks, 30,000 gallon water tanks and 14 cabins. The OPR Vessel will assist in the gathering of plastic and trash at domestic and international locations by targeting local and land-based coastline issues and tackling coastline plastics, containing them, collecting them, and reclaiming large-scale debris fields in the waterways. The 4ocean OPR Vessel contains an excavator barge, marsh excavator, fast landing craft and collection booms. The collection booms can be laid out in a petal fashion to reach a larger coverage area while having access to the beach. The design will bring the floating debris including plastic and trash to the beach for collection by the 4ocean team. The marsh excavator is a custom-built combination of a long reach excavator and a set of swamp tracks to work on soft soil in order to remove and separate plastics from mud. River mouths are oftentimes in under-developed low-income areas. Therefore, the logistics of trying to maneuver large equipment complicates the cleanup process. Small panga vessels can clean-up plastic and bring it to recycling facilities. These pangas can hold four to five supersacks carrying 1,500 pounds while the larger Ocean Plastic Recover Vessel can bring in 310,000 pounds in one trip alone. "The 4ocean OPR Vessel will transport massive amounts of plastic coupled with large booms to assist in the installation in all impactful river mouths," said 4ocean co-founder Alex Schulze. "Our mission with the OPR Vessel is to attack shoreline plastic simultaneously while booms are collecting plastic debris. At the same time, we will be handling reclamation projects in large geographic square areas to clean up the oceans and river deltas in order to make those areas functionable, usable and sustainable." 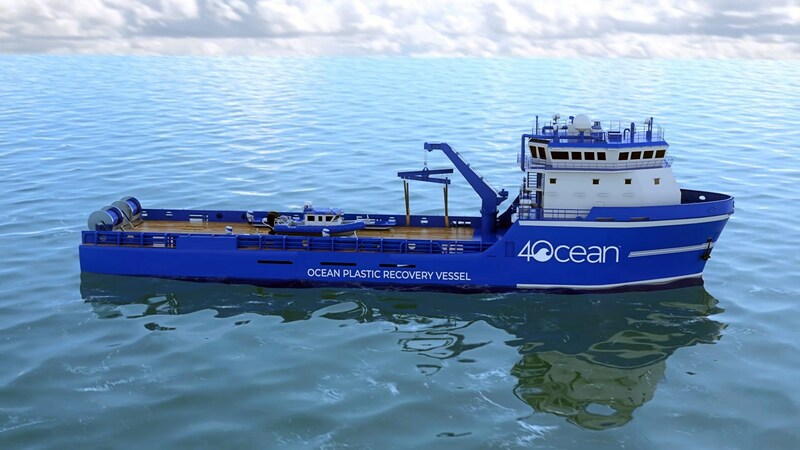 "Our new vessel has the ability to respond to any emergency situation to recover plastic including heavy rains and floods that frequently cause mass amounts of plastic to head offshore," stresses 4ocean co-founder Andrew Cooper. 4ocean will have four panga vessels, each 22 feet long. These smaller boats will be primarily used for cleanups in the Caribbean and Central America due to their ability to operate in high seas using a low horsepower motor. They are longer and more slender vessels and use less fuel. Panga vessels float shallow and are faster and more efficient for 4ocean crews to collect plastic from oceans and waterways. "Our new Bobcat excavator uses a custom claw and hook on the front with teeth to leave behind dirt and only grab plastic," notes Schulze. "Being that there is so much plastic in these impacted river mouth areas, our job is to collect as much plastic as possible, clean up these areas, install booms and employ locals to service and maintain the booms long-term." 4ocean's efforts are completely funded through the sale of recycled bracelets and sustainability products. With efforts well-established in South Florida since January 2017, Bali, Indonesia since May 2018 and Port-au-Prince, Haiti since September 2018, 4ocean plans to expand their ocean cleanups farther across the globe with the Ocean Plastic Recovery Vessel. Since its founding in January 2017, 4ocean has pulled over 2 million pounds of plastic and trash from the ocean and coastlines. 4ocean is a sustainability brand started by two twentysomething surfers, Alex Schulze and Andrew Cooper, with a vision of cleaning the ocean and coastlines, one pound at a time. Global cleanups are funded entirely through the sale of sustainability products, where every item purchased funds the removal of at least one pound of trash from the ocean. By creating jobs, utilizing the latest technology and raising awareness about the impact of trash in the ocean, the company is building the first economy for ocean plastic and creating a cleaner, more sustainable future for the ocean.